This bright and spacious corner unit is one of the most sought after plans in the building with beautiful views of the Inlet, mountains and city below. Bedrooms positioned on opposite ends of the unit allows for privacy and comfort while the main living space creates a perfect entertaining space with floor to ceiling windows. Unbeatable amenities with a pool/hot-tub, basketball/tennis courts, party rooms, fitness centres, guest suites and more! 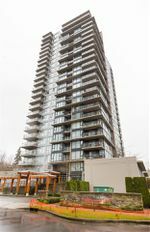 Ideal location with walking distance to shops, restaurants, recreation centre, Burrard Inlet/Rocky Point Park, Evergreen Line/West Coast Express and a pedestrian overpass to St. John St. New flooring and a fresh coat of paint makes this unit move-in ready! BONUS: 2 PARKING AND STORAGE!